England and the United States are both “common law” jurisdictions. What does that mean and why does it matter? Most legal systems are based on either Civil Code or Common Law. The system in which a lawyer practices can tell you a lot about their approach to their job, or legal philosophy more generally. 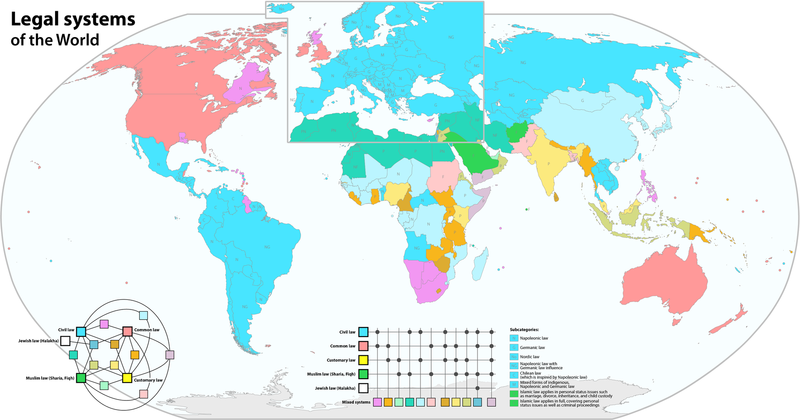 There are four main legal systems, including Civil (shown in blue) and Common Law (shown in pink). The other two systems are Religious law (Muslim, Jewish, etc) and Customary (indigenous, tribal, etc). In Civil Law jurisdictions, which are also known as “Napoleonic” or “Roman” systems, the core principles are codified into a written collection of laws and procedures set out in the civil code. Lawyers are inquisitorial rather than adversarial, and it is the judge (or judges), who ask questions and demand evidence. In a civil law system, lawyers present arguments based on the evidence the court finds. The judge’s role is to establish the facts of the case and to apply the provisions of the applicable code. Common Law, by contrast, puts great weight on court decisions, which are considered “law” with the same force of law as statutes. As such, common law courts have the authority to make law where no legislative statute exists, and statutes mean simply what courts interpret them to mean. In most scenarios, the two sides of a dispute argue before a neutral judge, who then makes a decision. The United States, like most Commonwealth countries and former colonies, is an heir to the common law legal tradition of English law. Of course, certain practices traditionally allowed under English common law have been expressly outlawed by the American Constitution, such as bills of attainder and general search warrants. Practically speaking however, most Americans and Brits will have the same understanding of the roles of lawyers, trials, contracts, and much more. Fun Fact: “Common law” derives its name from being common to all the King’s courts across England following the Norman Conquest of 1066. It was a little over four years ago that I secured my training contract. Now that I’ve successfully been through the process myself, here are a few tips on applying for training contracts and vacation schemes that I hope you might find helpful. It goes without saying that one of the most important skills any solicitor can have is the ability to organise and prioritise. One of the most helpful systems I implemented during my year-long search for a training contract was an extensive spread sheet. To begin, I listed out the main information of 100 or so firms with offices in London. This was a dispassionate research task: I tried to separate any emotion I felt regarding rankings or website design. I also looked at their salaries, which in retrospect only served as a distraction. If I had to do it all over again, I’d ignore the financial aspect and simply concentrate on recent deals and commercial awareness in relation to the firm’s core industries. Conducting this preliminary research forced me to spend about 10-15 minutes acquainting myself with just how many firms are out there. I strongly encourage this approach at the outset, because I promise that there are fantastic firms beyond the magic circle, silver circle, and big-name US firms. Group similar applications together. If you have a “mega-list” and a “maybe” list, take a look at your “maybe list” and compare the application forms. If a firm is only asking for a cover letter and a handful of standard questions (“why solicitor?” “why commercial law?” “what are the biggest challenges facing the legal sector today?”) it likely won’t take quite as long to complete when compared to a very bespoke application. Look beyond the numbers! I thought I’d have a better chance getting in with a firm that had 100+ vacancies, as opposed to a smaller firm. But the firm that finally offered me a contract actually only took 5 trainees per intake! Likewise, I wouldn’t worry too much about firm statistics such as PPP/profits per partner. Of course you want to be part of a business that’s doing well, but a lot can (and will!) change over the course of the next few years in the legal sector. A firm that’s doing marvelously today may struggle in a year’s time, and vice versa. Furthermore, indicators such as PPP don’t really tell the whole story. When you’re at the onset of your career, I’d suggest focusing on the things that will matter most to you, personally – things like time spent being mentored by senior associates or partners, your exposure to clients, opportunities for secondments or overseas seats, and the work/life balance you can expect to have. Take things with a pinch of salt. It’s practically impossible to outsmart “the system,” because there really is no coherent system! Sometimes it just boils down to timing, luck, or some aspect of personality you cannot predict. I worked at a particular firm for 8 months, and did very well on the vacation scheme. I thought I stood a very strong chance to secure a training contract, but for whatever reason, I just didn’t have the right “vibe” for the two partners that led my final interview. Although it hurt to be rejected, I knew that I couldn’t take it (too) personally. What works brilliantly for some might not work for you. If a firm looks good to you, APPLY. If a firm doesn’t look good to you (despite being the firm “everyone else applies to,”) DON’T APPLY. Just move on to something else. Don’t waste time agonising over the decision – you can always go back and submit an application later (before the deadline, of course) if you change your mind. This may be an unpopular opinion, but I believe that applying to at least 10 firms is the best approach. In total, between applying for training contracts and vacation schemes in 2013 and 2014, I sent out over 60 separate applications. If you’ve done well at university and have already secured a vacation scheme (or even an interview for one) then the likelihood is that the quality of your applications is already there. It then becomes a numbers game. Once you’re confident in your answers (and have had someone else proof-read for grammar/spelling mistakes!) send the application off, and then send off another one. And another one. And another one. When I was applying for vacation schemes in December 2013, the very last application I made (the day before the deadline!) ended up landing me a week-long placement at a big international firm.